Scientists discover a new way to deliver HIV meds via a once-a-week capsule, and it just might change the world. Researchers at the Massachusetts Institute of Technology and Boston’s Brigham and Women’s Hospital, in conjunction with Lyndra, a Bill & Melinda Gates Foundation-backed biomedical startup, have developed a way to deliver a week’s worth of medication in a single dose. This advanced technology can potentially revolutionize the way antiretroviral drug regimens are delivered to people living with HIV, drastically improving a patient’s adherence. The revolutionary delivery system is a small, six-pronged, starfish-shaped “backbone” that is encased in a capsule. Once the capsule dissolves in the stomach, the arms expand out to form the star-shaped configuration — too large to be passed from the stomach into the digestive tract, but still safe enough to remain in the stomach. The backbone of the device is made of a polymer, designed to maintain its integrity for one week before breaking apart and passing safely through the intestines. Each arm contains a week’s dosage of medicine, each within a different polymer designed to dissolve at a set rate. By matching the drug with the correct rate at which the chosen polymer will dissolve, researchers were able to combine drugs that used different schedules and doses within a single pill. Previous efforts had been unable to solve this problem. For many HIV-positive people on combination therapies, proper drug adherence can be an issue day by day. 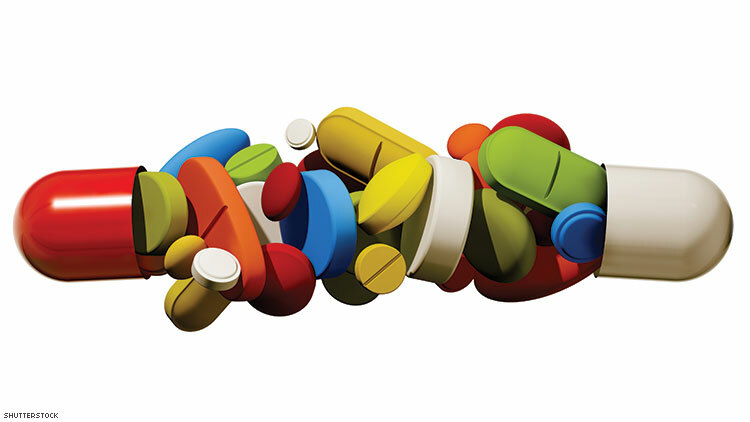 As of now, all combination therapy drugs on the market must be taken daily, which can lead to medication fatigue. Missing doses can increase the risk of drug resistance while decreasing the chances of remaining undetectable, whereby your viral load is so low that it becomes near impossible to transmit to an HIV-negative person. Without proper adherence, poz people can also become more susceptible to infections or other health issues. For now, Lyndra plans to limit their areas of focus; one of these areas is a partnership with Allergan to explore its use in Alzheimer’s and other neurological disorders. That could also benefit people living with HIV, as they can be more susceptible to neurological issues as they age. Moving forward, Lyndra hopes to also examine its potential for use in developing long-acting treatments for cardiovascular disease and diabetes. In much the way once-daily dosages of drugs revolutionized the treatment of HIV-positive people, so too does Lyndra’s new weekly capsule. No longer may it be “an apple a day to keep the doctor away,” but simply a once-weekly pill.